Angela Young is a friend and neighbor of Dede (Deidre) Evavold. Evavold is a close friend and confidant of Sandra Grazzini-Rucki, who she met during Sandra’s divorce with David Rucki. Young lives in St. 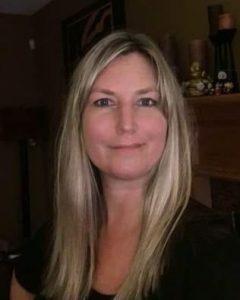 Cloud and she is a licensed marriage and family therapist (LMFT) and works for CORE Professional Services, P.A in Sartell, Minnesota. Young is a friend and neighbor of Dede (Deidre) Evavold. Evavold is a close friend and confidant of Sandra Grazzini-Rucki, who she met during Sandra’s divorce with David Rucki. Since 2013, Young has taken a very active role in defending both Evavold and Grazzini-Rucki and promoting their outlandish allegations about David Rucki and his family. 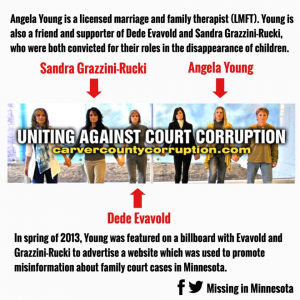 Young was featured on a public billboard in the spring of 2013 with Grazzini-Rucki and Evavold to advertise a website which was used to promote misinformation about family court cases in Minnesota. In July 2016, Grazzini-Rucki was found guilty on six counts of deprivation of parental rights for her role in the disappearance of her daughters, Samantha and Gianna Rucki. Evavold was charged and convicted of six felony counts of deprivation of parental rights for her involvement in the disappearance of Grazzini-Rucki’s daughters. In September 2016, Young’s name was mentioned in open court during Evavold’s criminal trial related to incriminating communications between Evavold, Grazzini-Rucki, and Young sent while the Rucki sisters were missing for 944 days. In February 2018, Evavold voluntarily testified in an emergency court hearing about her repeated harassment of David Rucki and his family and said Young published posts on her blog under Evavold’s name. Young has sent numerous text messages to Missing in Minnesota, threatening a lawsuit should her name be published about her involvement with Evavold, Grazzini-Rucki, and others connected to this case. In April 2018, Young contacted a company which provided technical support for Missing in Minnesota and threatened legal action in her voicemail message. Aside from threatening legal action, Young made numerous false statements in her voicemail message about the work of Missing in Minnesota. In her voicemail message, Young said she was a marriage and family therapist and later defended both Evavold and Kimberley Bukstein. Young was questioned by law enforcement during the investigation into the disappearance of the Rucki sisters. Young was never charged, nor was she one of the four people labeled as a “person of interest” by the Lakeville Police Department. Young’s involvement in many of the activities described above is why she has been labeled a “conspirator” on Missing in Minnesota.